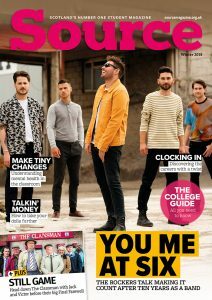 Source is Scotland’s only free careers and lifestyle publication for young people, distributed directly into high schools, colleges and universities every quarter. Source is kind of like that friend that knows everything – but not in an annoying way. We’re the guy that Scotland’s students turn to when they need a bit of advice, insider knowledge and inspiration when it comes to the future. The pages of Source are jam-packed with careers advice, study tips, education info and gap year inspiration, alongside celebrity interviews, health features and fun lifestyle articles. Over the years, Source has been nominated for major awards, landed interviews with massive names like Chloe Grace Moretz, Fearne Cotton, Nick Grimshaw and Twin Atlantic, spoken with Scotland’s First Minister, given away a gap year, run a fantastic short film competition, identified the next big name in fashion with our Passion for Fashion award… And we’re not stopping at that! Get the latest from Source at www.sourcemagazine.org.uk.